Black Magic are well known for manufacturing high quality terminal tackle such as hooks, leader and crimps. They also excel at producing high-end gamefishing equipment and accessories with their Black Magic Equalizer harness and gimbal set regarded as one of the best in the world. Another product they excel at producing is their resin headed skirted lures. I have been using the Black Magic Maggot for a few tuna seasons now and have had great success with it. It’s an ideal tune lure and I have caught both good numbers of yellowfin and southern bluefin with it. The Maggot has a 25mm pusher style head paired with a 7.5 inch skirt. A gin clear resin finish in the head allows great visibility of the large eye insert and coloured inner while also providing flash. The Maggot is available in 13 colour combinations and I have had most success with number 7 which is a large luminescent chartreuse over green and yellow. While it’s a great looking lure it’s greatest asset is its action and ability to catch fish. The Maggot has a tight action and a reliable rhythmic pattern in its swim. It has a classic pattern of splash, bubbles/dive-resurface and splash with a great smoke trail. Anyone what has set a spread will know the importance of understanding how a lure will behave and the Maggot offers a reliable action time and time again. The Maggot offers versatility as it can be placed anywhere in the spread and swim successfully, however, the majority of my fish have come from placing it on the shorter rigger. I rig my Maggot with a single hook stiff rig and generally run it on 24kg outfits with 300lb leader which does not in any way hinder the lures action. The Maggot offers great value for money and is a highly reliable lure that is a proven fish catcher. 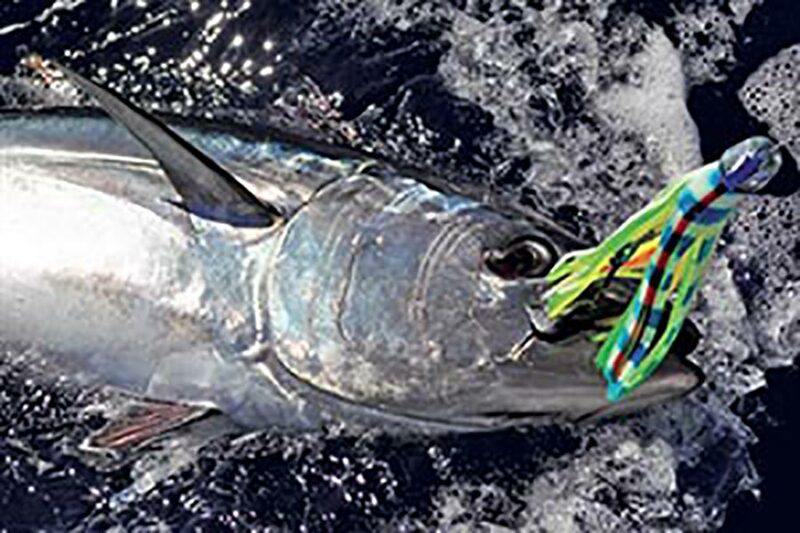 It has also caught its fair share of mahi mahi and would make a great sure for targeting small marlin.